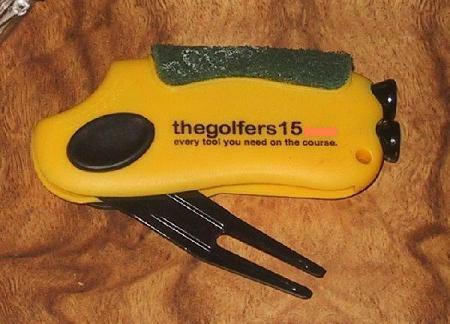 Golfers15 [Golfers15] - $14.95 : NewDaVincis.com!, Great Innovative Products, Gadgets and more. Every tool you need on the course.... 7 golf tools in 1 ! Will be available in June - Purchase now to reserve yours. It also easily attaches to your belt, bag, or cart. 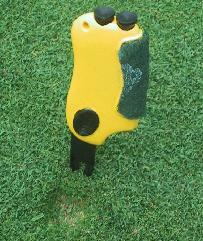 Throughout a round of golf, there are numerous times when you need a variety of tools to assist in playing the game. We chose the 7 most often used tools needed when playing a round. We then designed this ergonomic golf multi-tool into one easy-to-use and compact product. ?14 clubs in your bag and the15 in your pocket.? The15 has some of the more typical tools built in, such as the tees and tee receptacle, marker receptacle, and a fork. However, we have developed some new tools using Scotch-Brite, and have a patent pending concave ball and convex face cleaner with Smart Scrubber. the15 can be used to hold your clubs above ground in wet conditions, and the tips of the fork are made to clean various groove shapes and sizes. In addition, the chassis has been ergonomically designed to become a handle during three of the applications: face scrubbing, ball cleaning, and fork use while also proving handy for the repair of any turf or ball marks. 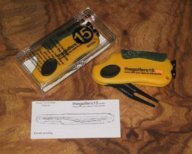 the15 is compact enough to fit in your pocket, while also providing an access hole for a key ring. The ergonomically rounded sides, curves and edges were designed to allow for maximum hand comfort, leverage, control, and movement. And very light weight. You found you ball in deep rough the15 marks it for you. 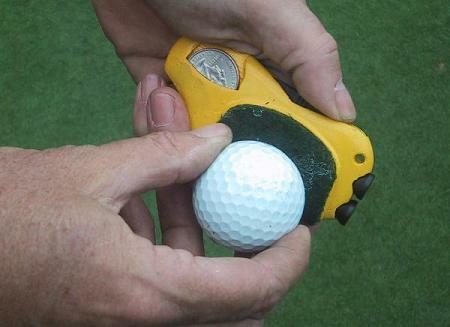 Ball markers are needed throughout every hole of golf. But we all loose ball markers. the15 receptacle is designed to fit a new U.S. Quarter. the 15 Chassis is made from strong and durable ABS. 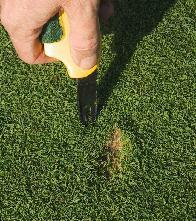 The fork is madeÂ tough durable & weatherproof for turf and greens. ?And the15?cleans up easily with soap and water. Make the most of every shot.